Facing the heat of global warming, farmers in San Diego are trying to survive and build resilience through practice—and are pushing policymakers to keep up. In California’s Pauma Valley, a flat stretch of crop- and rangelands at the base of the Palomar Mountains in San Diego County, July is usually a month of hot weather and raucous growth—with lemons, avocadoes, blackberries, and peppers all flourishing. This past July 4, temperatures hit 89°F, which quickly rose to 104° the next day. On July 6, AccuWeather logged a blistering spike to 114°; at Solidarity Farm—which covers 12 acres at the southwest tip of the valley—co-owner Ellee Igoe measured field temperatures of 121°. The heat withered watermelons and cucumbers right on their vines, burned the leaves on lettuces, and led to crop failures on carrots and cilantro. About half a season’s work was wiped out in hours. As the effects of climate change wrought record-breaking heat havoc across the globe last summer, the devastation at Solidarity underlined the importance of some of the farm’s current work. Igoe has been offering technical assistance to her neighbors, the Pauma Band of Luiseño Indians, who are getting ready to plant 30 acres of olive trees in spring 2019. Some funding for the project came from a Healthy Soils grant from the California Department of Food and Agriculture (CDFA). These grants support efforts to sequester carbon and reduce greenhouse gas emissions, and in the case of the Pauma Band’s olives, the money pays for cover cropping. The olives are part of a larger demonstration project to determine how well certain plantings will retain soil moisture and sequester carbon after being grown with climate-beneficial cover cropping and no-till methods; the state provides funding for some of these projects, thanks to Governor Jerry Brown’s commitment to drastically reducing California’s carbon footprint. But it’ll take a minimum of three years to get a good measure of soil moisture, about five years to get a good measure of carbon, and even longer for the science from this endeavor to be translated into practical use for other farmers. It is a frustrating position that San Diego’s agriculture community finds itself wedged into: the need to hurry up and make meaningful change, contrasted with the slow-moving nature of policy, science, and getting a disparate group of stakeholders to agree on a course of action. 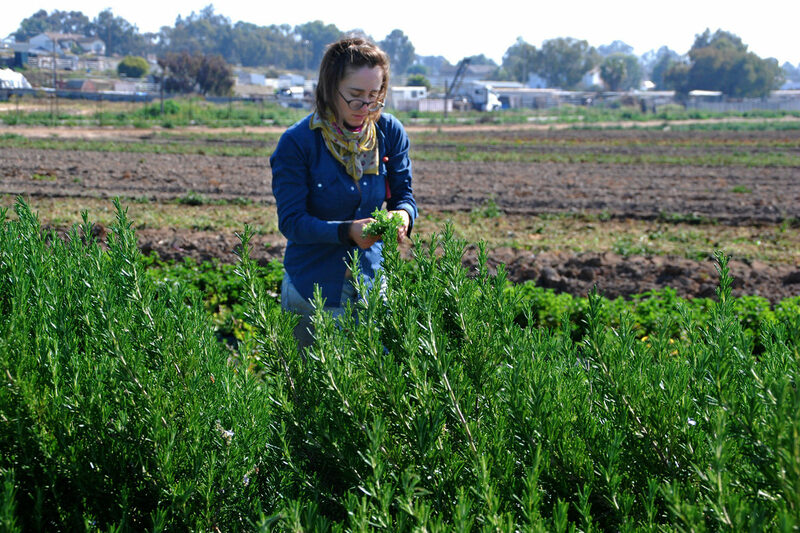 Promisingly, the San Diego Farm Bureau (SDFB) and the San Diego Food System Alliance (SDFSA) recently released a carbon farming report that laid out a series of steps that work towards climate mitigation and resilience. To that end, the SDFB and the SDFSA have assembled a task force that includes the resource conservation folks, county representatives, scientists, environmental groups, regulators, and farmers like Igoe, to figure out what’s doable, where the money for it will come from, and who to lobby for policy change—then loop in area farmers when they’ve got a plan that’s “more than just a concept,” says SDFB Executive Director Eric Larson. San Diego County contains 200,000 acres of rangelands, and 81,000 acres of croplands—more than 50 percent of which are devoted to tree fruits, mostly citrus and avocado. The main farming expense is water—about $2,000 per acre-foot, and more when there is extreme heat and drought. This exorbitant cost has led to the loss of 10,000 acres of orchard trees alone in the last 10 years. Taking trees—or any plants—out of the ground leads to a soil carbon deficit, as does any conversion of former farmland to development. If farmers can save money on water, and stay in business, this will help the county reach the mitigation and resilience goals it set in its own Climate Action Plan this past February. The task force is “looking for any way to generate revenue for farmers and also help them be part of a climate change solution,” says Elly Brown, SDFSA’s alliance director. To that end, Igoe and others are trying to make sense of a whole battery of variables around what sorts of plantings will support a range of goals for everyone. Beyond the immediacy of the weather, there are other challenges. For one, the county of San Diego has one climate action plan, and the city of San Diego has another—and their strategies do not necessarily coincide. For example, while the city is allocating funds to plant new trees as wind-reducing, moisture-retaining hedgerows, in the broader county, orchards receive no monetary incentives for keeping their long-standing carbon-beneficial trees in the ground—incentives that would help them defray operating costs. The Pauma Band’s attempt to sustainably grow olives trees—chosen because they can survive droughts, and also because their fruit fetches a high price on the market—might potentially show a way to open up a path to crop-bearing trees and other drought-tolerant plants being somehow grant-fundable. “That could be an obvious win-win, if you could harvest your hedgerow,” Skjellerudsveen says. Healthy Soils and Conservation Innovation grants from the USDA’s Natural Resource Conservation Service do reward composting, because the practice helps soil retain water and reduces runoff. And farmers could apply for grants to apply compost to their fields. Coincidentally, this would also put them on track to switch to no-till and cover-cropping. But Larson says there isn’t enough compost available in the county to make this a viable option. On the other hand, the city of San Diego has a surplus of compost, but no efficient way to get it to farmers. These are all gaps the task force seeks to close. They’re just getting started—they had their first meeting the first week of August—but they are trying to move as fast as they can against the rapidly shifting weather. “There are currently no really good, systemic, institutional answers, and that should lend urgency to our insistence at the political level that mitigation be sped up and resources applied to adaptations,” says Renata Brillinger, executive director of policy advising at California Climate & Agriculture Network. This is especially true in the wake of the United Nations’ recent report, which places us much further along the path to climate crisis than scientists initially thought. Photos CC-licensed by Suzie’s Farm.